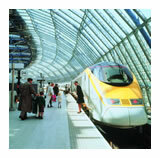 Rail Canterbury can help you with all of your Eurostar ticket and reservation needs. We offer the full range of tickets for travel from all UK points of embarkation including, Ashford, Ebbsfleet, and St Pancras International stations. Eurostar operate the high speed train services between London St Pancras International, Ebbsfleet International and Ashford International to Calais, Lille Europe, and Paris in France and Brussels in Belgium. For over 15 years this has been the fastest way to travel from the UK to Mainland Europe. There are also frequent trains to Disneyland Paris as well as seasonal direct trains to Marseille in France and to the French ski resorts near Bourg St. Maurice. Eurostar is, more often than not, the starting point for travelling to further European destinations and we can combine the best Eurostar fares available with other train company’s European tickets to give you the best package to the destination you choose.